Why call him an evil doer? It has nothing to do with religion. I've never gotten around to looking at the book series, Conversations with God. 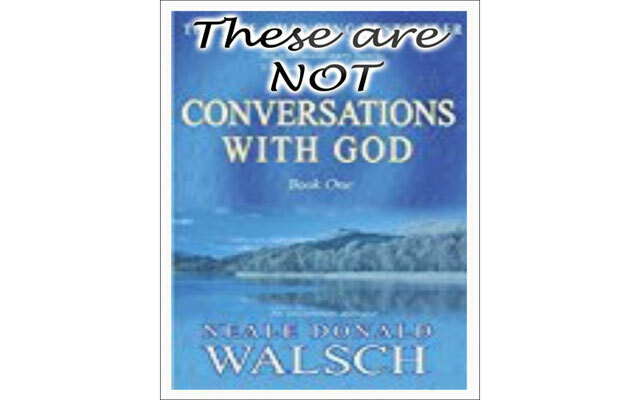 Then a few days ago, I listened to an interview with the author, Neale Donald Walsch, and I have a major message: these are NOT conversations with God. So what, you may go. Why bother mentioning this? 2 reasons. First, because of what the books preach. Second, because these books are a kind of Bible to millions of the politically correct. They have reached 20 to 25 million people. In other words, many people lap up Walsch's words, as his interviewer did - Vishen Lakhiani, of Mindvalley. For Vishen, Walsch is a mentor. For me, as I found out, listening to the interview, he is a misleader, dangerous because so many people listen as if he does indeed have a direct line to God. I don't mean that Walsch intends to do evil. But in his soft, somewhat-catatonic-sounding, somewhat-spiritual-sounding tones, he misleads. What's the message? Why does it disturb me enough that I'm writing to you about it? Because it strongly reinforces unfounded PC beliefs. Here are 4 indications that no good god had anything to do with Walsch's words - that instead they encourage people to accept PC falsehoods. ONE. Early in the interview, Walsch talked about our living at a time when a huge shift is happening. Fine. I think we're all noticing huge shifts. But he put all religions together, as having functioned one way and a shift now being needed. This is presented as if it were a fact. Instead, he is reinforcing belief in a very popular PC untruth. The reality: as can easily be shown, not all religions have been or are at the same stage. For instance, the Jain religion, where compassion and non-violence are central, is not at the same stage as Islam, where violence (like striking off the heads of unbelievers) is permitted to further Islam. My point: unexamined words are dangerous. TWO. When Walsch had been going on, in his soft blurry voice, for perhaps half an hour, I was stopped cold at first one thing and then another. The interviewer mentioned that he prevented the theft of his cell phone, but let the thief run off. He felt a bit guilty, because he did not protect the would-be thief's next victims. He was dazzled by Walsch's response: Walsch would have stopped the man gently, putting a soft hand on the would-be thief's arm, and would have offered the man whatever the cell phone cost - or even double that. Punishment - what good would that do? There was no recognition that not all thieves are poor fellows, down on their luck - and also no recognition that not all of us have 300 or 600 (or whatever it is) available to hand out to would-be thieves. In other words, Walsch responded with the prevalent PC narrative about poor poor victims, just needing some loving kindness. Most likely he and Angela Merkel would get along fabulously. THREE. Then came what was, for me, the final nail in the coffin. Continuing on in his soft blurry voice, Walsch mildly and gently castigated the backward people who believe in walls and divisions. The interviewer could barely contain his adulation. This was all too perfectly wonderful: here was Walsch, against walls, in such a mild loving way. The pro-wall people were clearly a foolish barbaric lot, but they would surely soon be swept up in the tide of love without borders. Walsch, with your wealth, for the moment you don't need to face reality - the reality of the danger that has come into the countries of the West. You are insulated from the reality of the ideology of Islam, the reality too of the raging politically correct Left - and of a culture where theft and looting are considered signs of victimization. Walsch, you endanger everyone, lulling people to stay asleep. So, Walsch, you may, with your soft blurry voice, continue to feed your adoring followers your slushy mushy poisonous words. My words are part of the wake-up call going out to the politically correct, to the West - a wake-up call sent in different ways by those of us awake to the danger we are in. So, to those willing to listen, I say: Neale Donald Walsch has not been having conversations with any benign deity or cosmic force. And that's not all that's wrong with Walsch. FOUR. There is something else about Walsch, that he shares with many New Age people. His writings have not been written by him, or so he claims. They have been, to use his term, "downloaded." In other words, he believes that someone else, God apparently (according to him), has dictated the words. I don't think his soft syrupy tones would go well with adherents of Islam, who believe the Quran - and not Walsch's Conversations with God - is the "downloaded" truth from God. But that's not what's important here. That the books are supposedly "downloads" seems to give them extra validity, for Walsch as well as for many readers. After all, why question anything supposedly from some god? The answer. The evidence, just from the interview with Walsch, indicates that no benign god had anything to do with Walsch's writings. That leads to an important question: who or what is the source for Walsch's words? Is it some split-off part of Walsch himself? Is it some non-benign cosmic force, deity, spirit? Is it some human-made mind control? What I know: I am writing this. I write all I write. I am not downloading. I say: pay attention to reality. That will break the spell, if you are in any way caught in Walsch's spell. I was going to end there, when my favorite question popped into my mind: do what do we do? and what do I do? I've let you know my sense of Donald Neale Walsch. And I will post this to Facebook. There is one other step I can take. This was in response to the widespread interfaith groups, where people ignore truths that might be uncomfortable, notably for Islamics. Sunday, November 26, 11 am EST. PS. Stay tuned. Something huge is coming next week. Very exciting. There will be an interview. And two suggested actions. One, most of you will fine very easy to do. The second, many of you may find harder. But the results, we are sure, will be exciting. As I said, stay tuned.